On Friday, the social media giant put out an announcement about the incident, acknowledging that attackers were able to gain unauthorized access to account information for roughly 30 million users, and explaining just how it happened. The company says it will soon be sending customized messages to users affected by the hack, detailing exactly how much of their information was exposed. However, if you want to find out if you're among the 30 million, and just how many of your personal details may have been swiped, you can easily check it right now. 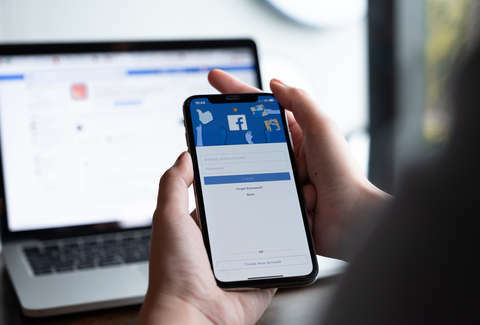 Facebook has launched a new section in its Help Center that not only outlines the details of the security breach, but provides info on whether you were affected. To see it, visit this page, and scroll down past the information about the investigation. You should see a blue highlighted section labeled "Is my Facebook account impacted by this security issue?" Here, you'll see one of three different outcomes. You'll either see a confirmation that you were unaffected, that your account was targeted but your information was impacted, or that your account was targeted and impacted. 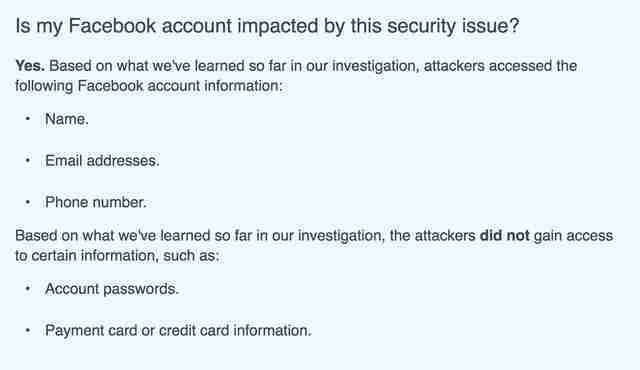 If your account was targeted and impacted, you'll see a list of the account information Facebook believes was impacted, as well as any it believes was not impacted. In other words, it'll give you a better sense of just how much of your identity and activity was potentially poached, ranging from your name, email address, and phone number, to your relationship status, most recent searches, and recent locations checked into. In its announcement, the company says its continuing to work with law enforcement to further investigate the extent of the breach, but claims there are no signs that the attackers are using any of the hacked information to infiltrate third-party apps and services. Still, it offers a number of tips on how to avoid phishing scams, and advises being extra cautious about opening unwanted texts or emails. While making more details about the breach public is certainly a move in the right direction, Facebook is still in the hot seat over a number of other issues, and has been facing enormous backlash. A recent report in Gizmodo revealed that the company has been quietly using your contact information to target users for advertising purposes. And that's not to mention the Cambridge Analytica scandal that rocked the world earlier this year, in which it was discovered that personal information of nearly 87 million Facebook users was shared with a London-based data-mining firm ahead of the 2016 US Presidential Election. In any case, if this latest bit of troubling news will probably have even more people questioning whether to pull the plug from the biggest social network in the world. There are two ways you can go about saying goodbye to Facebook: deactivating your account and deleting your account. While deactivating your account is meant to be a temporary move, deleting your account is permanent. Here’s how to do both, according to Facebook’s Help Center.